This story of love and addiction starts together with this blog and my discovery of beauty gurus on Youtube and ends with a collection of 32 eyeshadows and counting. 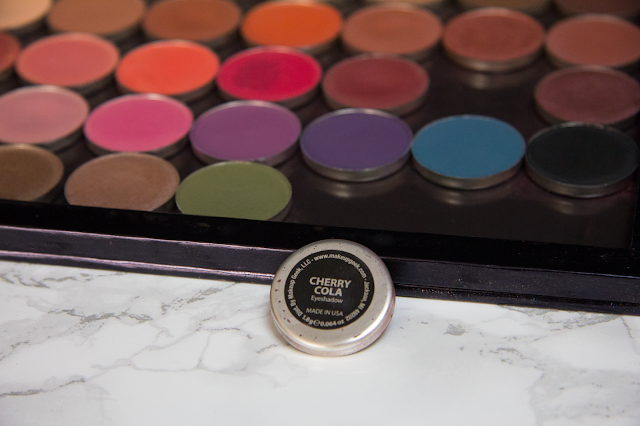 In this post I want to share my love for Makeup Geek eyeshadows and my collection so far. The idea is for this to be the first post in my Makeup Stash series, where I share what is in my makeup collection with swatches and reviews. These will be posts in progress that will be updated with new entries as I receive them. Makeup Geek started in 2008 with Marlena’s youtube channel and blog, which became a platform to share looks, techniques and passion for all things beauty. 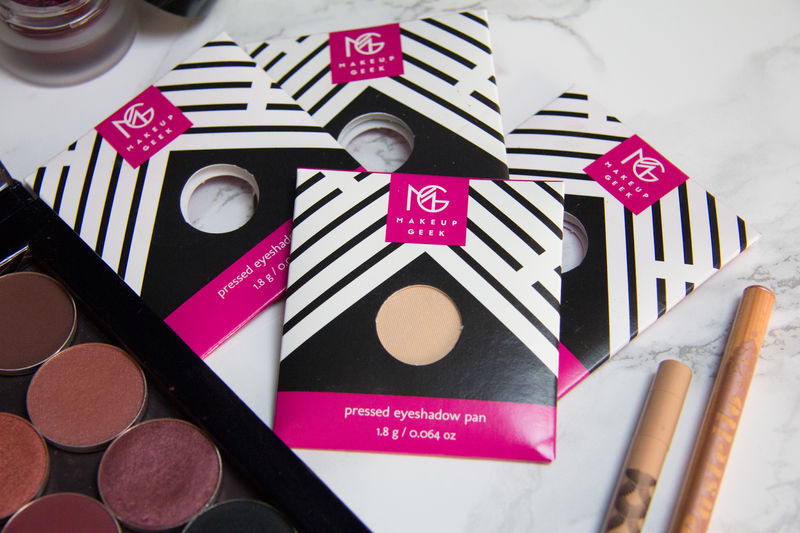 In 2012 Marlena launched the Makeup Geek line of eyeshadows and has expanded since then thanks to the incredible quality of the products and the affordable prices. Marlena explains: “Sephora mark up products by 30 to 40 percent — a savings I pass on to customers.”(source) The makeup line now includes eyeshadows in multiple finishes, including duochrome and foiled, pigments, blushes and is rumored to expand to highlight and contour products and liquid lipsticks in early 2016. The company is based in California, USA but ships worldwide at reasonable prices, therefore I started with small orders for 5-6 shadows and built up my collection, until November 2015 when Makeup Geek became available in the European online retailer Beauty Bay. Finally there is no more risk for customs costs (which are 40% of the value and a pain to pay) and fast delivery in the old continent. Since then my collection has grown some more, thanks to the low retail price of the shadows at 6.90€ on beautybay.com. The quality of the Makeup Geek eyeshadows is overall amazing, with the mattes being my favorites and including a few fails which you’ll see down below. In general though, the blendability and pigmentation are amazing. 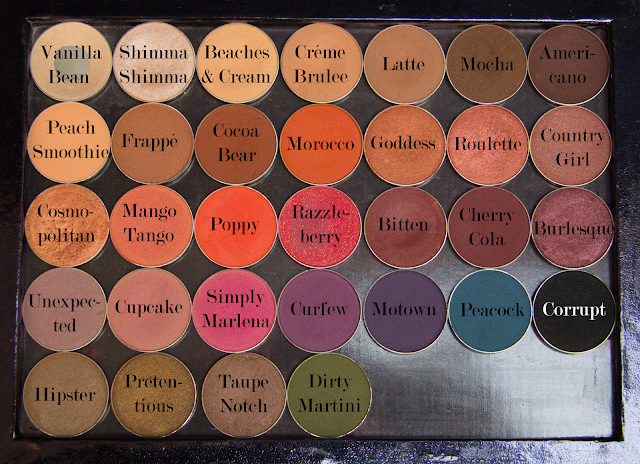 In showing you my collection, I will include the official description found on the Makeup Geek website and my comments on each single shadow. The swatches are made on my arm without primer and swiped a few times with my finger, to be able to show the color properly. When writing this post I own only Makeup Geek eyeshadows in pan form from the basic collection, so no foiled eyeshadows or duochromes, but this may change in the near future. Let’s get started. First Row: these are the Makeup Geek eyeshadows I use on a daily basis to prep, blend, transition and shade. Vanilla bean: light shimmer with peachy beige undertone. This is the only shadow I have hit pan on, ever, and I have a back up already. I use it everyday to set my eyeshadow primer and highlight the brow bone. I haven’t ever noticed the shimmer though..
Shimma Shimma: shimmery highlight. This is my go-to inner corner highlight and the shadow that with one swipe illuminates the eyes incredibly. Creme Brulee: medium sand color with a soft matte finish. Another amazing transition shade, slightly darker. Latte: matte medium brown. This is my go-to first crease shade that I use for both complex and the simplest look, using it to correct my eye shape with a very natural shadow. Mocha: matte warm medium brown. I use this both in the outer v to give depth and on my brows. Americano: dark brown with subtle purple undertones and a matte finish. This is one of the new mattes with the new formulation and an incredible deep outer v and liner shade. Peach Smoothie: soft matte light peach beige. Ok this one is so similar to Beaches & Cream that I would suggest to get one or the other, not both. Anyhow, a great transition shade with a wonderful soft texture. Frappe: medium maple brown matte. Beautiful crease shade, adds warmth to any look. Cocoa Bear: matte golden brown. One of the most popular shades in the range, called after Marlena’s husband. This is also one of my most used shades. Morocco: rich burnt orange with a matte finish. Incredible shade, it was the first of the new mattes that I really longed for. 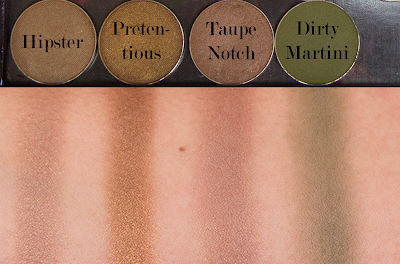 Great blending shade for all my favorite warm smokey eyes. Goddess: metallic pale copper. Amazing! Roulette: a rosy, burnt sienna with a silky shimmery finish. Even more amazing! Country Girl: shimmery pink brown. From the pan you expect a silver shimmer on a medium brown base but the pigmentation is poor and the texture is hard. Unfortunately not one of my favorites. Cosmopolitan: rose gold with gold flecks and a shimmery finish. A beautiful color, perfect all over the lid. Mango Tango: peachy pink with flecks of gold. Another unfortunate formula similar to Country Gold, with not enough pigmentation. Poppy: matte orange with subtle pink undertones. I didn’t use this much until I watched a tutorial by Jaclyn Hill and now it goes in the crease when I do dark smokey eyes to give some color and it looks amazing. Razzleberry (discontinued): raspberry pink with gold glitter. Another disappointingly dry formula with unfortunate glitter. I tried to use it wet for a stronger effect but rather ended up ruining the top layer of the shadow. Sigh. Bitten: matte deep maroon red. One of my first MUG shadows, I had high expectations but was a bit disappointed by how light this translates on the eyes, not the deep outer v color I thought it was. Still love it though. Cherry Cola: matte deep brown with strong red undertones. This is everything that I was missing from Bitten: the depth and darker shade doesn’t translate well in the swatch, but you can see the difference in the pan. It has become one of my favorites. Burlesque: metallic muted burgundy with warm undertones. A shade that makes most people squeal when they swatch it, it doesn’t show up as well on camera. A beautiful shade. Unexpected: light and subtle pink matte purple blend. This looks like a sad mousy grey on my skin tone and is absolutely invisible on my eyes. Cupcake: matte medium pink. Very underrated but incredibly useful crease color. I use it for pink and purple looks but can be used really anytime. Simply Marlena: rosey pink with purple undertone and gold flecks. I totally missed the gold flecks in this one as well and thought it was a matte shade until I went to add the description from the MUG site. A shade I don’t use much, also due to it’s slightly drier formula. Curfew: matte medium plum purple. New addition to my collection, I thought it was darker from the swatches but still a gorgeous plum. Motown: matte deep eggplant purple. Another one that I expected would be darker. I recently purchased it but didn’t have the chance to use it in a look yet. Peacock: matte deep teal blue. It is more of a medium shade for me, since it is too light to give enough depth in the outer corner. Corrupt: intense matte black with a small bit of sparkle. The best black shadow ever that is matte for every intent and purpose! Hipster: dark sand and light taupe tan with slight shimme.r. A shade I do not understand completely and therefore use very rarely. Pretentious: metallic bronze. Has a wonderful texture and is not an obvious shade. Taupe Notch: is just described as a taupe shade and isn’t properly a matte but has a slight sheen to it. Dirty Martini: matte olive green. A must-have for green lovers, great to blend in the crease. The Makeup Geek eyeshadows come in pan form and are intended to be stored in a magnetic palette like these I showed here or the Zpalette (in the pictures). Each eyeshadow contains 1.8 grams of product and is approximately 2.65 cm in diameter, the same size as MAC and Morphe Brushes eyeshadow pans. All Makeup Geek eyeshadows are cruelty-free, talc and paraben-free, and you can find the full ingredients list here. If I had to choose which ones are my favorite Makeup Geek eyeshadows I’d say Shimma Shimma, Cocoa Bear, Créme Brulee, Cherry Cola and Morocco. But to be honest it’s like picking which one is my favorite child. I hope this swatch and review post on my Makeup Geek collection is useful in helping you pick your next Makeup Geek eyeshadow or have an idea of some colors in the range. These are only some of the 50+ shades available, there is something for everyone! Do you own any of these? Which are your favorites? May 2016 update post with 10 new swatches here. August 2016 update post with 18 new swatches and comparisons here.